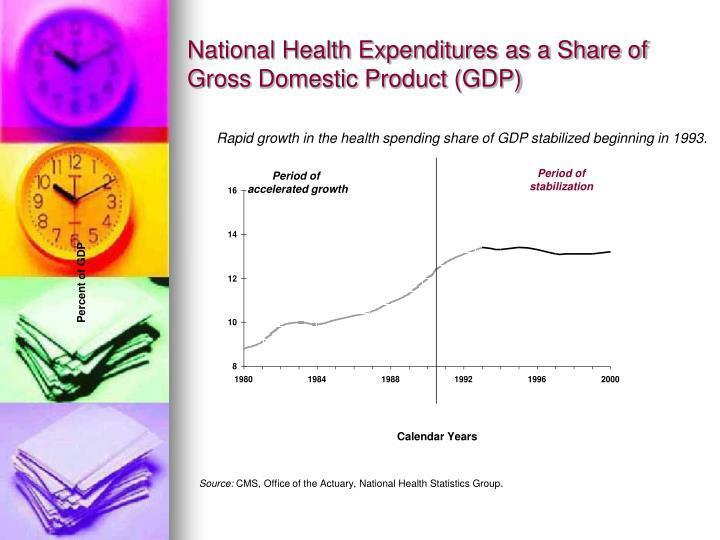 Rapid growth in the health spending share of GDP stabilized beginning in 1993. 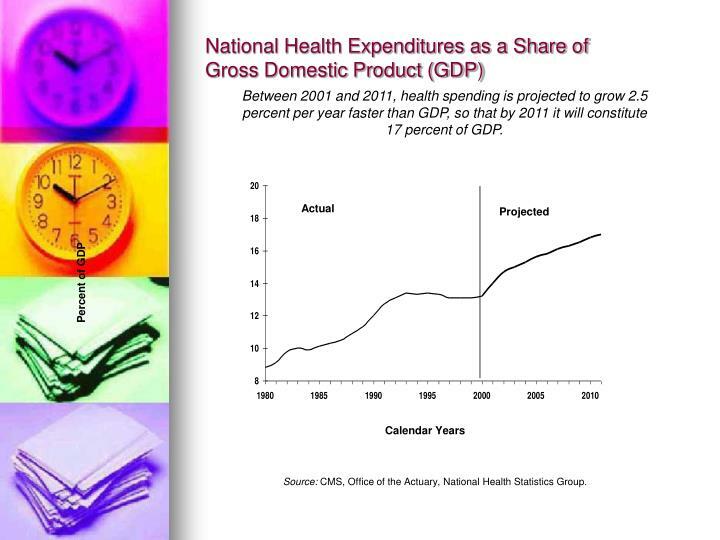 Between 2001 and 2011, health spending is projected to grow 2.5 percent per year faster than GDP, so that by 2011 it will constitute 17 percent of GDP. 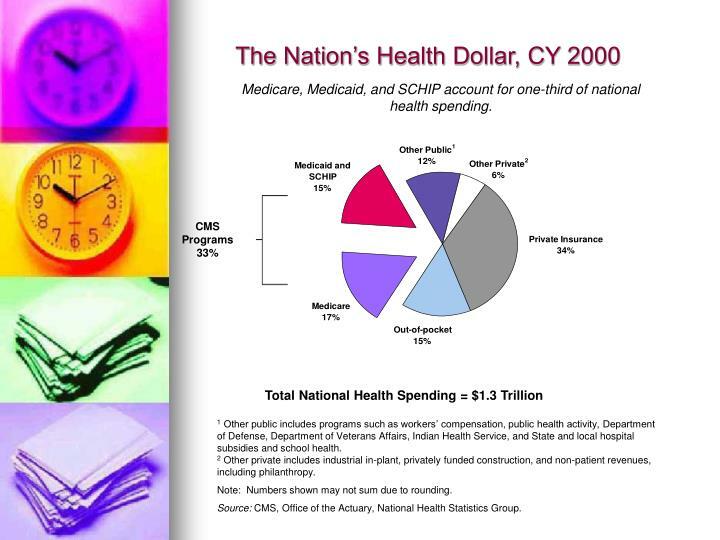 Medicare, Medicaid, and SCHIP account for one-third of national health spending. 1 Other public includes programs such as workers’ compensation, public health activity, Department of Defense, Department of Veterans Affairs, Indian Health Service, and State and local hospital subsidies and school health. 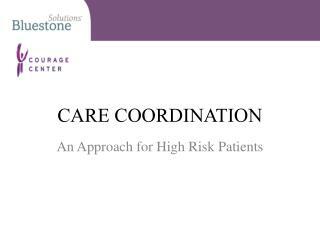 2 Other private includes industrial in-plant, privately funded construction, and non-patient revenues, including philanthropy. Note: Numbers shown may not sum due to rounding. 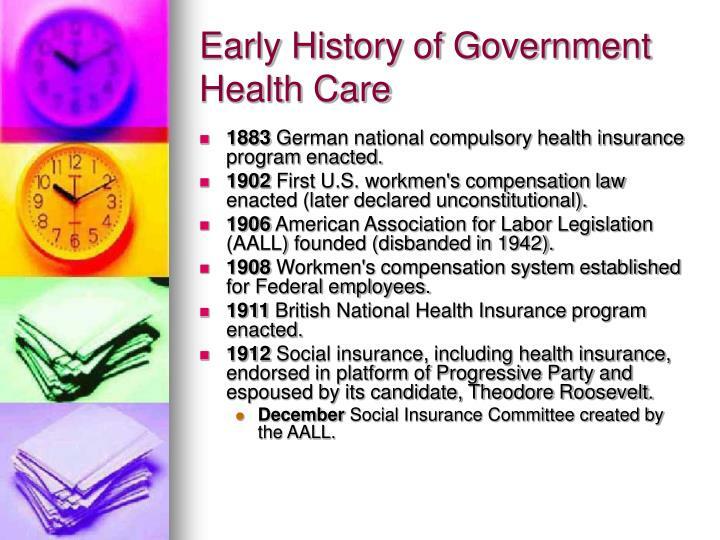 1883 German national compulsory health insurance program enacted. 1902 First U.S. workmen's compensation law enacted (later declared unconstitutional). 1906 American Association for Labor Legislation (AALL) founded (disbanded in 1942). 1908 Workmen's compensation system established for Federal employees. 1911 British National Health Insurance program enacted. 1912 Social insurance, including health insurance, endorsed in platform of Progressive Party and espoused by its candidate, Theodore Roosevelt. December Social Insurance Committee created by the AALL. 1913AALL Social Insurance Committee report favors State-run compulsory health insurance. June AALL sponsors First National Conference on Social Insurance, in Chicago. 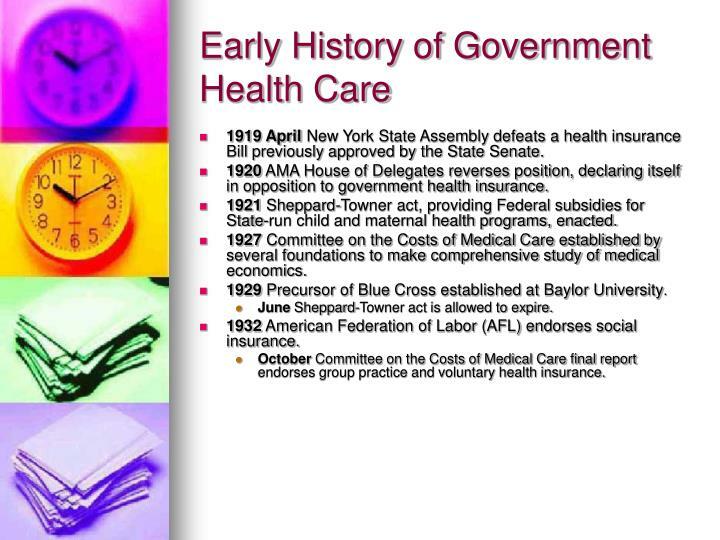 1915 November A "standard" health insurance Bill is published for State consideration, by AALL. 1916 Congressional hearings on health insurance. 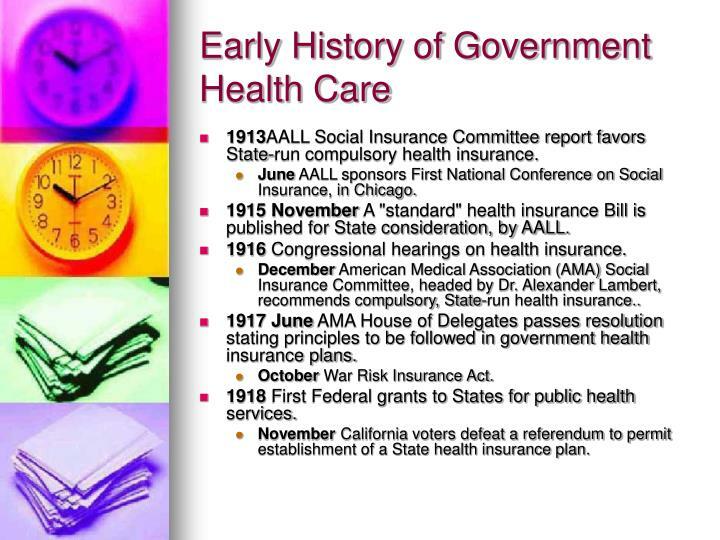 December American Medical Association (AMA) Social Insurance Committee, headed by Dr. Alexander Lambert, recommends compulsory, State-run health insurance..
1917 June AMA House of Delegates passes resolution stating principles to be followed in government health insurance plans. October War Risk Insurance Act. 1918 First Federal grants to States for public health services. November California voters defeat a referendum to permit establishment of a State health insurance plan. 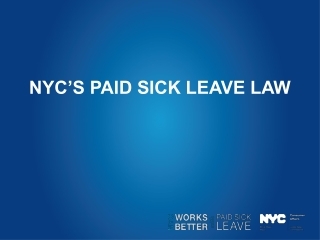 1919 April New York State Assembly defeats a health insurance Bill previously approved by the State Senate. 1920 AMA House of Delegates reverses position, declaring itself in opposition to government health insurance. 1921 Sheppard-Towner act, providing Federal subsidies for State-run child and maternal health programs, enacted. 1927 Committee on the Costs of Medical Care established by several foundations to make comprehensive study of medical economics. 1929 Precursor of Blue Cross established at Baylor University. June Sheppard-Towner act is allowed to expire. 1932 American Federation of Labor (AFL) endorses social insurance. 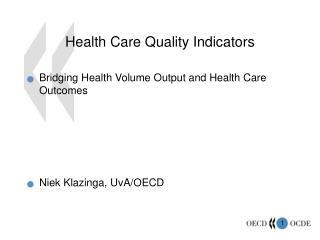 October Committee on the Costs of Medical Care final report endorses group practice and voluntary health insurance. 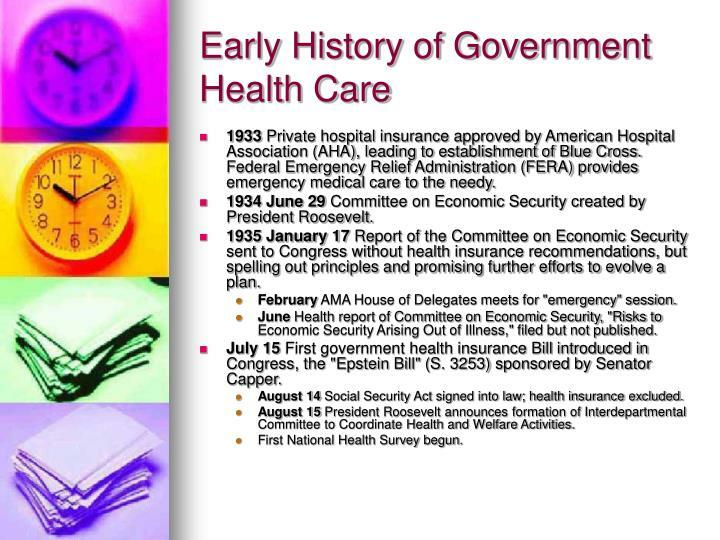 1933 Private hospital insurance approved by American Hospital Association (AHA), leading to establishment of Blue Cross. Federal Emergency Relief Administration (FERA) provides emergency medical care to the needy. 1934 June 29 Committee on Economic Security created by President Roosevelt. 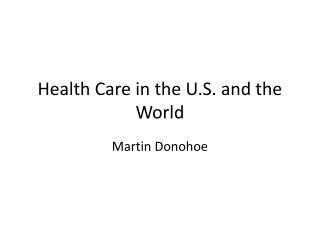 1935 January 17 Report of the Committee on Economic Security sent to Congress without health insurance recommendations, but spelling out principles and promising further efforts to evolve a plan. February AMA House of Delegates meets for "emergency" session. June Health report of Committee on Economic Security, "Risks to Economic Security Arising Out of Illness," filed but not published. July 15 First government health insurance Bill introduced in Congress, the "Epstein Bill" (S. 3253) sponsored by Senator Capper. August 14 Social Security Act signed into law; health insurance excluded. August 15 President Roosevelt announces formation of Interdepartmental Committee to Coordinate Health and Welfare Activities. First National Health Survey begun. 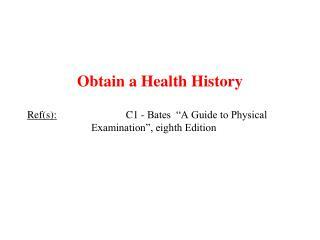 1937 Technical Committee on Medical Care established under Interdepartmental Committee. 1938 February Report of the Technical Committee on Medical Care, A National Health Program,published. 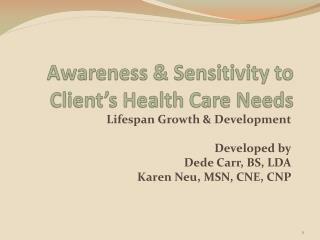 July 18-20 National Health Conference convened in Washington, D.C., under sponsorship of Interdepartmental Committee. 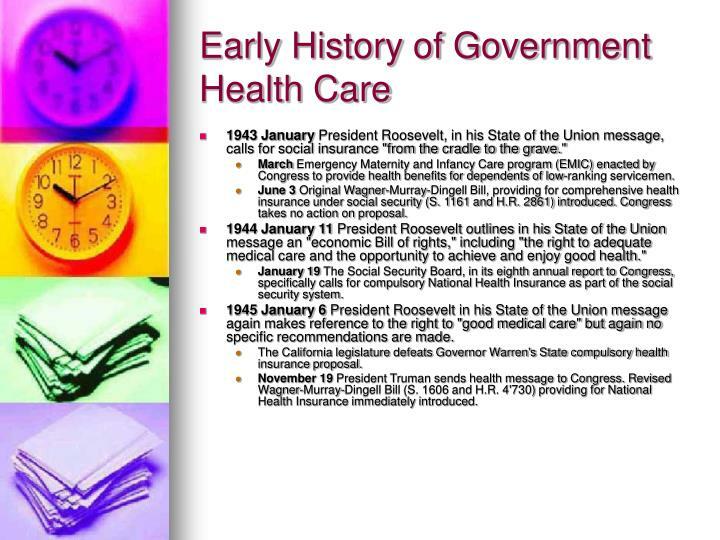 1939 February 28 Senator Robert F. Wagner introduces "National Health Bill" (S. 1620) incorporating recommendations of National Health Conference. AMA establishes "National Physicians' Commit-tee for the Extension of Medical Service" to fight Wagner Bill. April 29-July 13 Hearings on Wagner Bill; proposal dies in committee. 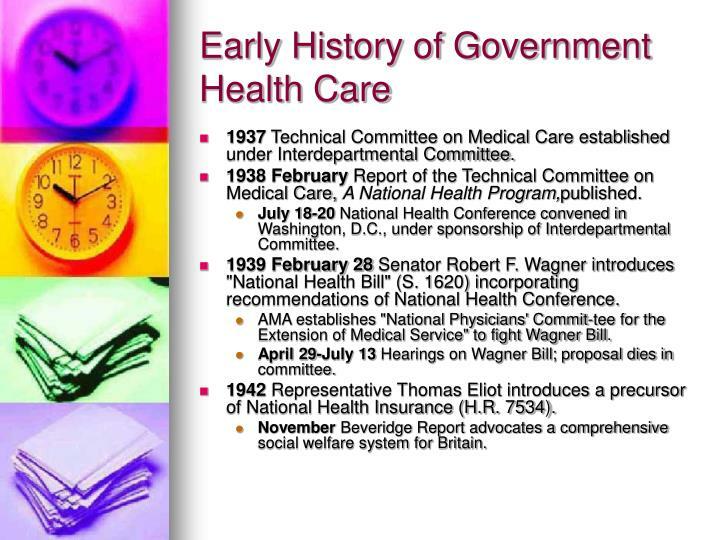 1942 Representative Thomas Eliot introduces a precursor of National Health Insurance (H.R. 7534). November Beveridge Report advocates a comprehensive social welfare system for Britain. 1943 January President Roosevelt, in his State of the Union message, calls for social insurance "from the cradle to the grave." March Emergency Maternity and Infancy Care program (EMIC) enacted by Congress to provide health benefits for dependents of low-ranking servicemen. June 3 Original Wagner-Murray-Dingell Bill, providing for comprehensive health insurance under social security (S. 1161 and H.R. 2861) introduced. Congress takes no action on proposal. 1944 January 11 President Roosevelt outlines in his State of the Union message an "economic Bill of rights," including "the right to adequate medical care and the opportunity to achieve and enjoy good health." January 19 The Social Security Board, in its eighth annual report to Congress, specifically calls for compulsory National Health Insurance as part of the social security system. 1945 January 6 President Roosevelt in his State of the Union message again makes reference to the right to "good medical care" but again no specific recommendations are made. The California legislature defeats Governor Warren's State compulsory health insurance proposal. November 19 President Truman sends health message to Congress. Revised Wagner-Murray-Dingell Bill (S. 1606 and H.R. 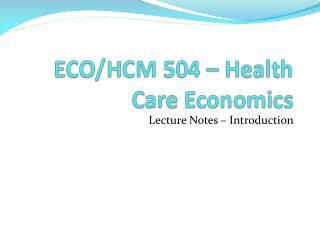 4'730) providing for National Health Insurance immediately introduced. 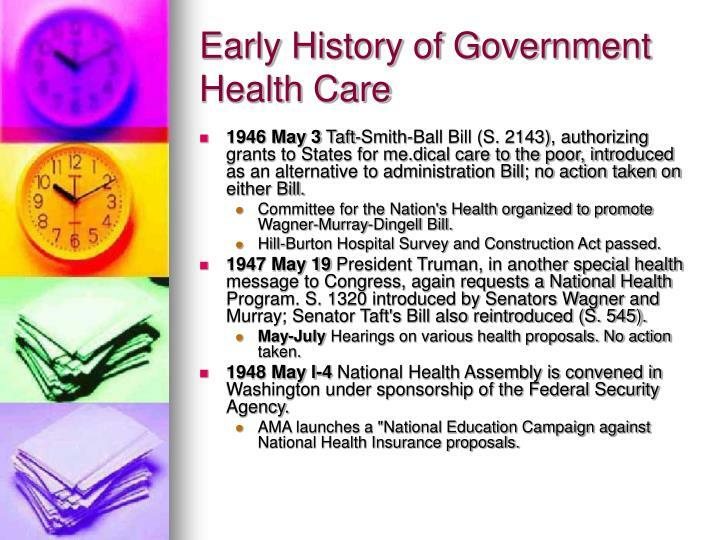 1946 May 3 Taft-Smith-Ball Bill (S. 2143), authorizing grants to States for me.dical care to the poor, introduced as an alternative to administration Bill; no action taken on either Bill. 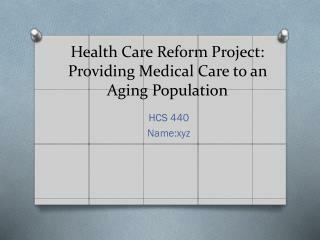 Committee for the Nation's Health organized to promote Wagner-Murray-Dingell Bill. Hill-Burton Hospital Survey and Construction Act passed. 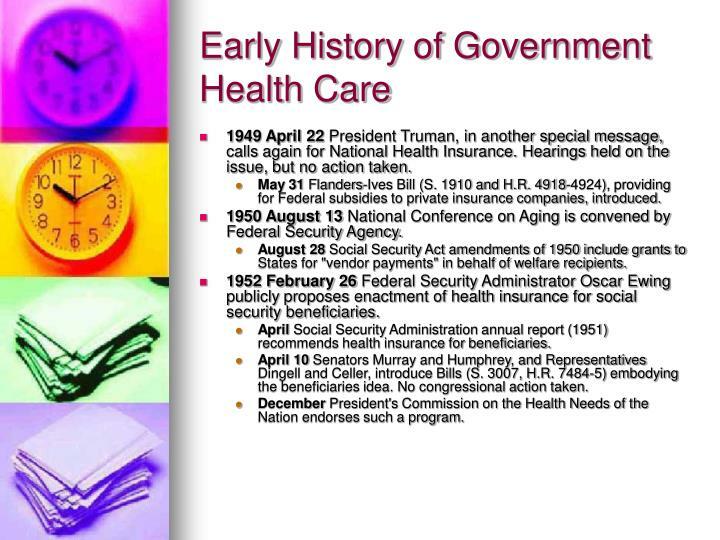 1947 May 19 President Truman, in another special health message to Congress, again requests a National Health Program. S. 1320 introduced by Senators Wagner and Murray; Senator Taft's Bill also reintroduced (S. 545). 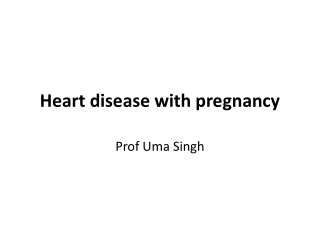 May-July Hearings on various health proposals. No action taken. 1948 May l-4 National Health Assembly is convened in Washington under sponsorship of the Federal Security Agency. AMA launches a "National Education Campaign against National Health Insurance proposals. 1949 April 22 President Truman, in another special message, calls again for National Health Insurance. Hearings held on the issue, but no action taken. May 31 Flanders-Ives Bill (S. 1910 and H.R. 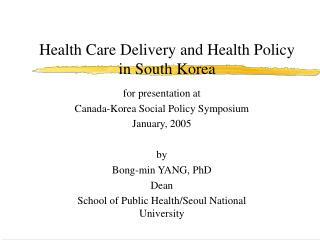 4918-4924), providing for Federal subsidies to private insurance companies, introduced. 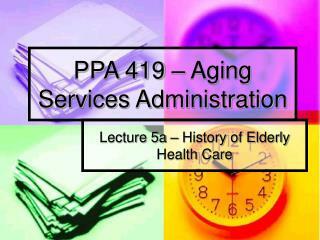 1950 August 13 National Conference on Aging is convened by Federal Security Agency. August 28 Social Security Act amendments of 1950 include grants to States for "vendor payments" in behalf of welfare recipients. 1952 February 26 Federal Security Administrator Oscar Ewing publicly proposes enactment of health insurance for social security beneficiaries. April Social Security Administration annual report (1951) recommends health insurance for beneficiaries. April 10 Senators Murray and Humphrey, and Representatives Dingell and Celler, introduce Bills (S. 3007, H.R. 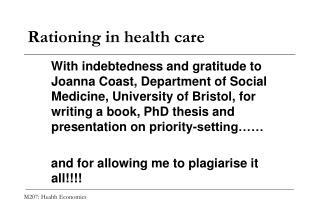 7484-5) embodying the beneficiaries idea. No congressional action taken. 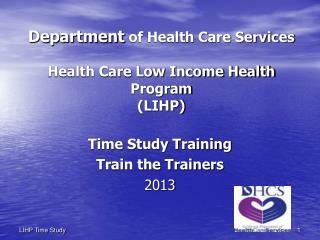 December President's Commission on the Health Needs of the Nation endorses such a program. 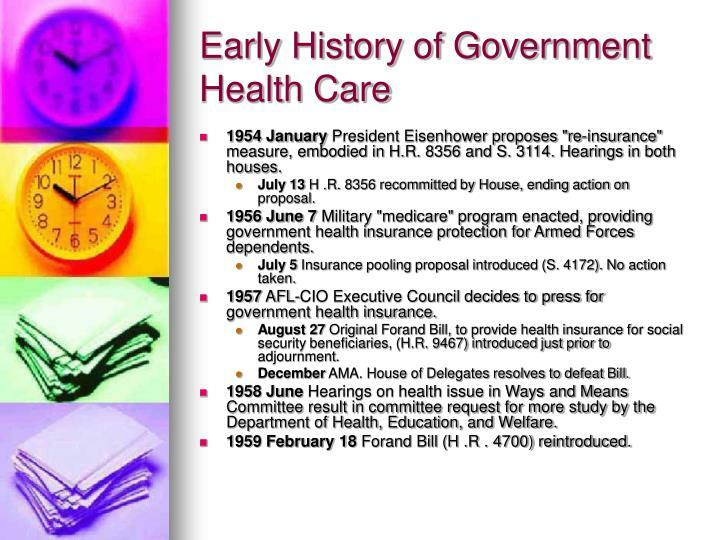 1954 January President Eisenhower proposes "re-insurance" measure, embodied in H.R. 8356 and S. 3114. Hearings in both houses. July 13 H .R. 8356 recommitted by House, ending action on proposal. 1956 June 7 Military "medicare" program enacted, providing government health insurance protection for Armed Forces dependents. July 5 Insurance pooling proposal introduced (S. 4172). No action taken. 1957 AFL-CIO Executive Council decides to press for government health insurance. August 27 Original Forand Bill, to provide health insurance for social security beneficiaries, (H.R. 9467) introduced just prior to adjournment. December AMA. House of Delegates resolves to defeat Bill. 1958 June Hearings on health issue in Ways and Means Committee result in committee request for more study by the Department of Health, Education, and Welfare. 1959 February 18 Forand Bill (H .R . 4700) reintroduced. 1960 March 14 Ways and Means Committee begins extended sessions on amendments to the Social Security Act. March 31 Ways and Means Committee votes on Forand Bill in executive session; Bill defeated 17-8. 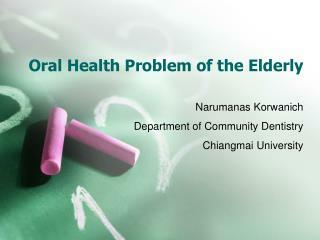 April Senate Subcommittee on Problems of the Aged and Aging holds hearings, primarily on health needs of the elderly. May 4 HEW Secretary Flemming presents administration proposal for a Federal-State pro-gram of protection against the cost of long-term and expensive illness for low-income elderly. June 3 Ways and Means Committee's second vote on Forand Bill; defeated again 17-8. Vote on stripped-down Bill, providing hospital benefits only, also defeated, 16-9. June 13 After more than 3 months of deliberation, Ways and Means Committee reports Social Security amendments (H.R. 12580), including a new program of Federal grants to the States for medical services to the "medically indigent" elderly. June 29 The 1960 Annual Conference of Governors calls for congressional enactment of medical insurance for the elderly under social security. August 23 After rejecting a Kennedy-Anderson amendment embodying the health insurance approach, as well as a Javits amendment embodying the administration plan, the Senate approves a modified version of H.R. 12580, known as the Kerr-Mills Bill. September 13 Kerr-Mills Bill signed into law. 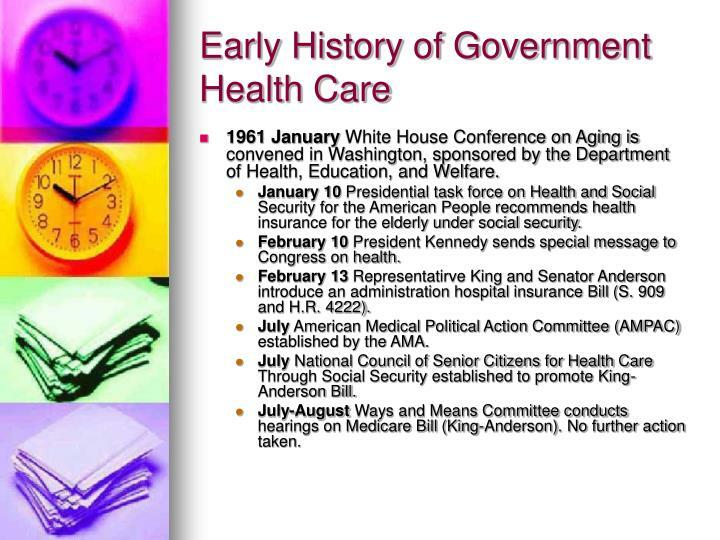 1961 January White House Conference on Aging is convened in Washington, sponsored by the Department of Health, Education, and Welfare. January 10 Presidential task force on Health and Social Security for the American People recommends health insurance for the elderly under social security. February 10 President Kennedy sends special message to Congress on health. February 13 Representatirve King and Senator Anderson introduce an administration hospital insurance Bill (S. 909 and H.R. 4222). July American Medical Political Action Committee (AMPAC) established by the AMA. July National Council of Senior Citizens for Health Care Through Social Security established to promote King-Anderson Bill. July-August Ways and Means Committee conducts hearings on Medicare Bill (King-Anderson). No further action taken. 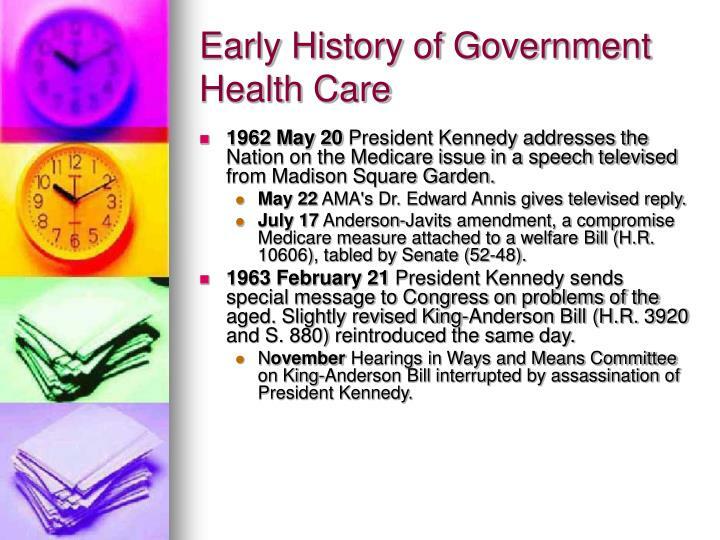 1962 May 20 President Kennedy addresses the Nation on the Medicare issue in a speech televised from Madison Square Garden. May 22 AMA's Dr. Edward Annis gives televised reply. July 17 Anderson-Javits amendment, a compromise Medicare measure attached to a welfare Bill (H.R. 10606), tabled by Senate (52-48). 1963 February 21 President Kennedy sends special message to Congress on problems of the aged. Slightly revised King-Anderson Bill (H.R. 3920 and S. 880) reintroduced the same day. November Hearings in Ways and Means Committee on King-Anderson Bill interrupted by assassination of President Kennedy. 1964January Ways and Means Committee completes hearings. February 10 President Johnson sends special message, "Health of the Nation," to Congress, advocating Medicare. June 24 Ways and Means Committee executive session decides to postpone action on Medicare. July 7 Ways and Means Committee reports Social Security amendments (H.R. 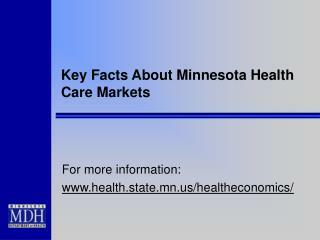 11865) which include a cash benefit increase but no health care proposal. July 24 H .R. 11865 passed by the House. August 6 Senate Committee on Finance begins hearings on H.R. 11865. August 20 H.R. 11865 reported by the Finance Committee without the addition of a health insurance provision. September 2 Medicare measure passes Senate (49-44) as a floor amendment to H.R. 11865. October 2 House-Senate Conference Committee deadlocks, being unable to resolve differences, between Senate and House versions of H.R. 11865. 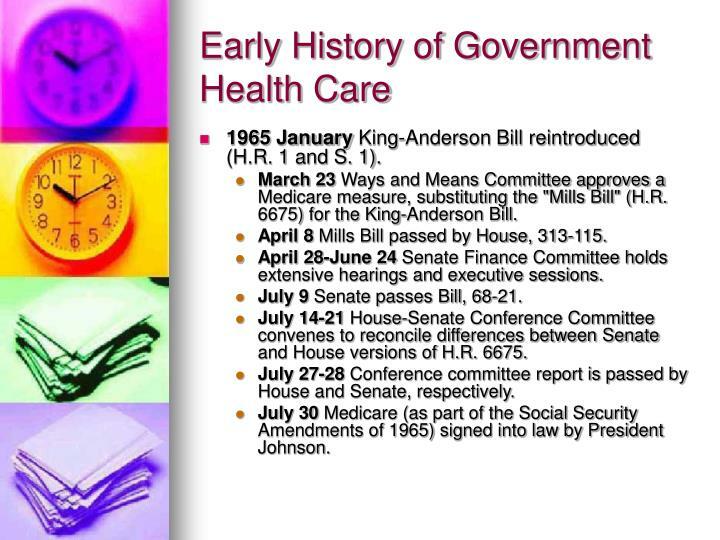 1965 January King-Anderson Bill reintroduced (H.R. 1 and S. 1). March 23 Ways and Means Committee approves a Medicare measure, substituting the "Mills Bill" (H.R. 6675) for the King-Anderson Bill. April 8 Mills Bill passed by House, 313-115. April 28-June 24 Senate Finance Committee holds extensive hearings and executive sessions. July 9 Senate passes Bill, 68-21. July 14-21 House-Senate Conference Committee convenes to reconcile differences between Senate and House versions of H.R. 6675. July 27-28 Conference committee report is passed by House and Senate, respectively. July 30 Medicare (as part of the Social Security Amendments of 1965) signed into law by President Johnson. 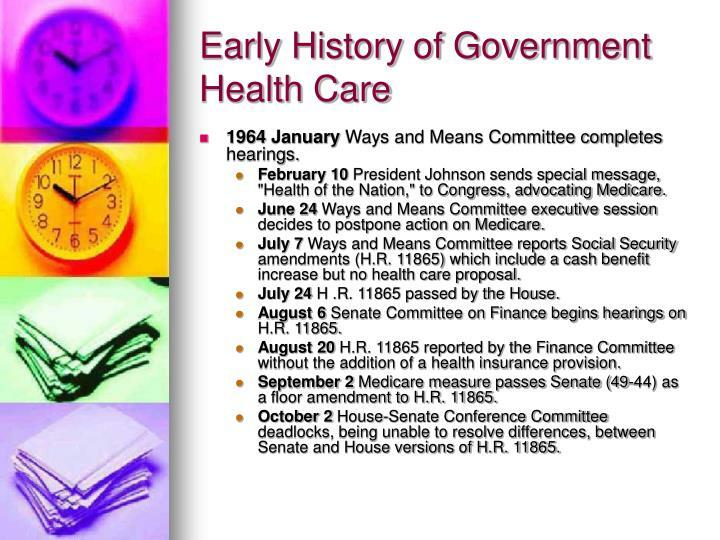 1965 Medicare and Medicaid were enacted as Title XVIII and Title XIX of the Social Security Act, extending health coverage to almost all Americans aged 65 or older (e.g., those receiving retirement benefits from Social Security or the Railroad Retirement Board), and providing health care services to low-income children deprived of parental support, their caretaker relatives, the elderly, the blind, and individuals with disabilities. 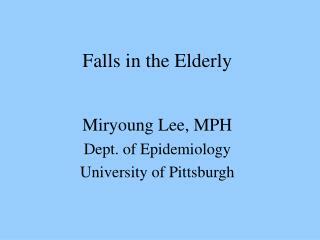 Seniors were the population group most likely to be living in poverty; about half had insurance coverage. 1966 Medicare was implemented and more than 19 million individuals enrolled on July 1. 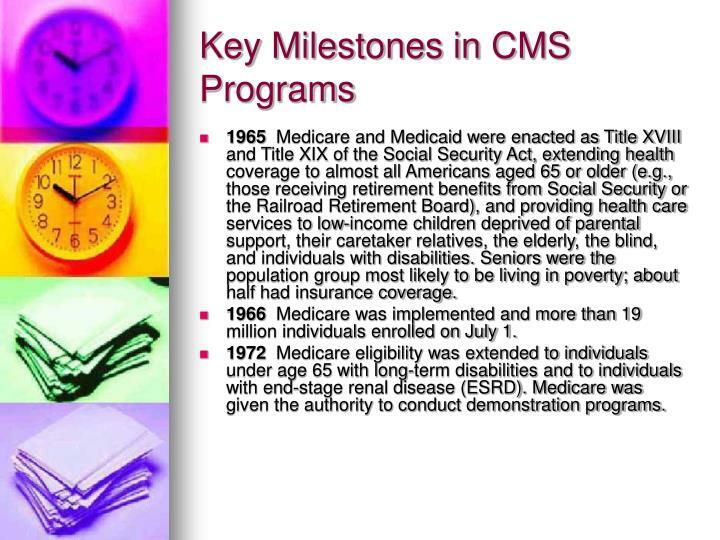 1972 Medicare eligibility was extended to individuals under age 65 with long-term disabilities and to individuals with end-stage renal disease (ESRD). Medicare was given the authority to conduct demonstration programs. 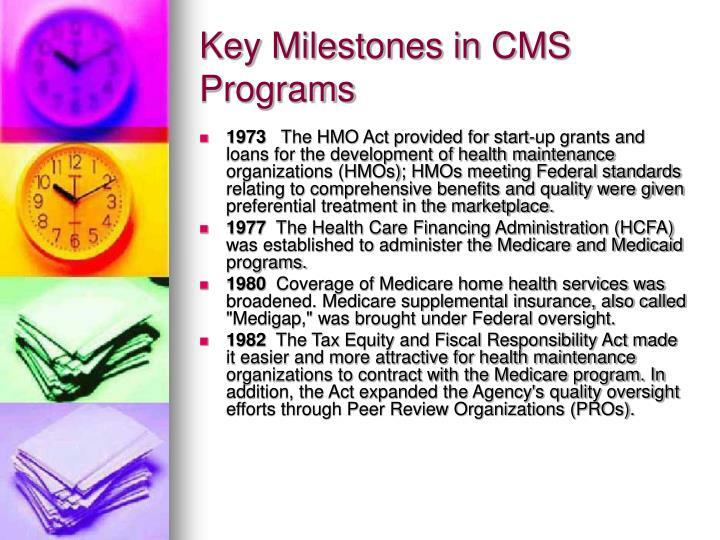 1973 The HMO Act provided for start-up grants and loans for the development of health maintenance organizations (HMOs); HMOs meeting Federal standards relating to comprehensive benefits and quality were given preferential treatment in the marketplace. 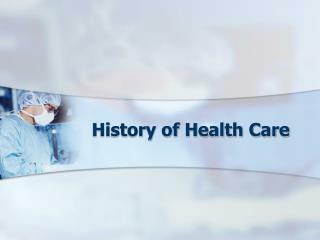 1977 The Health Care Financing Administration (HCFA) was established to administer the Medicare and Medicaid programs. 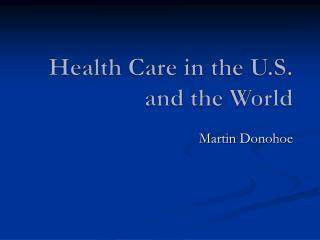 1980 Coverage of Medicare home health services was broadened. 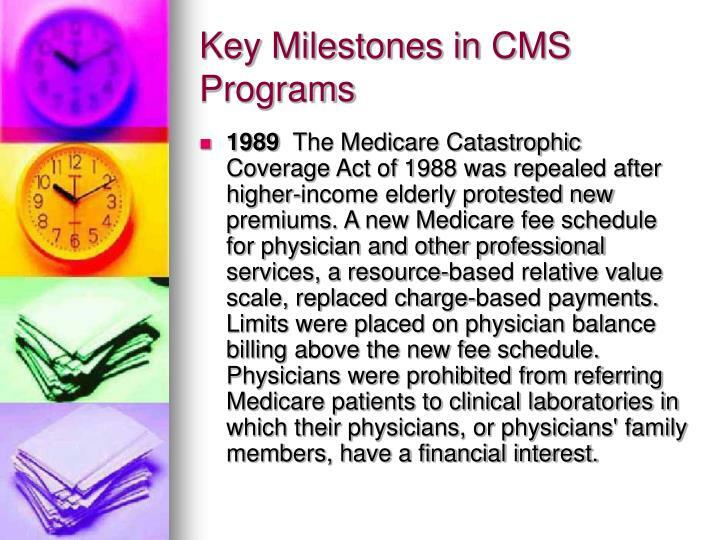 Medicare supplemental insurance, also called "Medigap," was brought under Federal oversight. 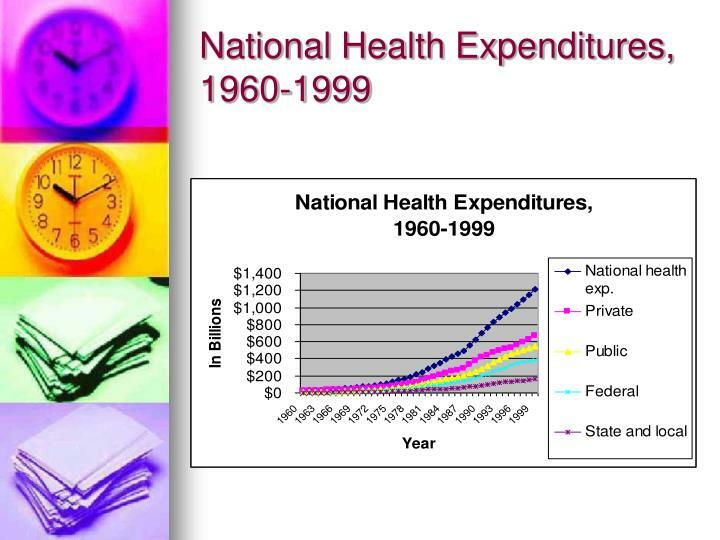 1982 The Tax Equity and Fiscal Responsibility Act made it easier and more attractive for health maintenance organizations to contract with the Medicare program. In addition, the Act expanded the Agency's quality oversight efforts through Peer Review Organizations (PROs). 1983 An inpatient acute hospital prospective payment system for the Medicare program, based on patients' diagnoses, was adopted to replace cost-based payments. 1985 The Emergency Medical Treatment and Labor Act (EMTALA) required hospitals participating in Medicare that operated active emergency rooms to provide appropriate medical screenings and stabilizing treatments. 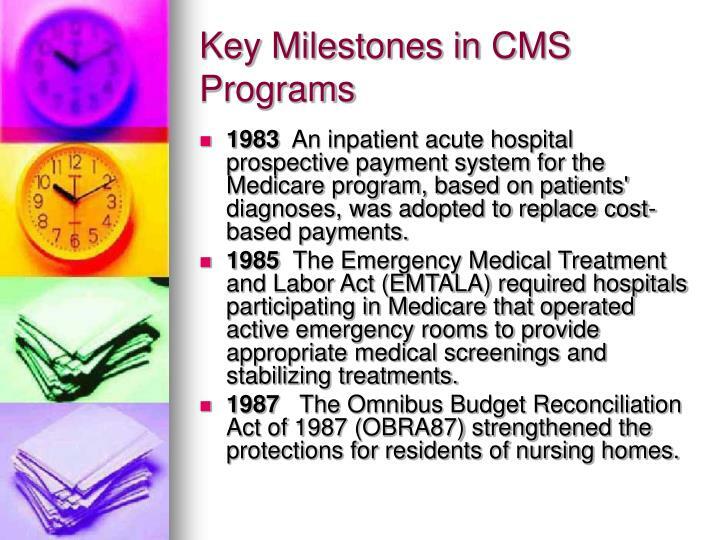 1987 The Omnibus Budget Reconciliation Act of 1987 (OBRA87) strengthened the protections for residents of nursing homes. 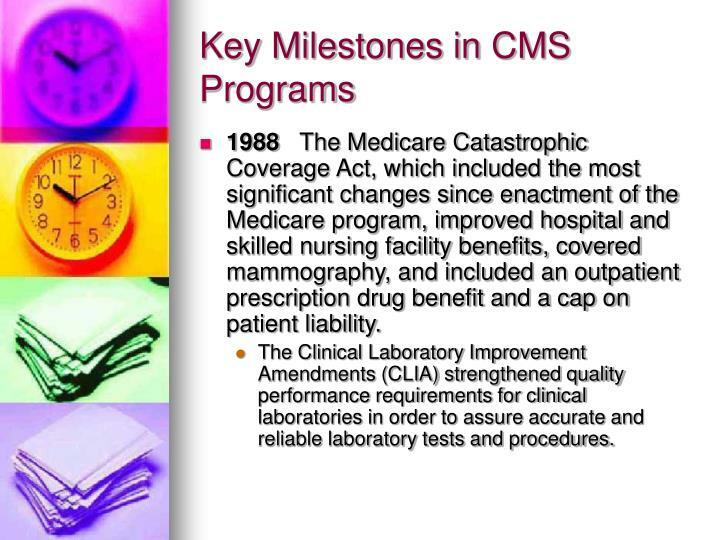 1988 The Medicare Catastrophic Coverage Act, which included the most significant changes since enactment of the Medicare program, improved hospital and skilled nursing facility benefits, covered mammography, and included an outpatient prescription drug benefit and a cap on patient liability. The Clinical Laboratory Improvement Amendments (CLIA) strengthened quality performance requirements for clinical laboratories in order to assure accurate and reliable laboratory tests and procedures. 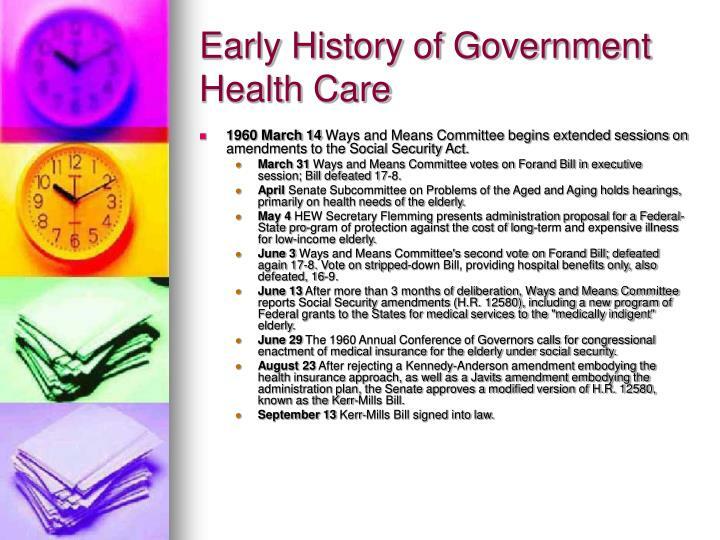 1989 The Medicare Catastrophic Coverage Act of 1988 was repealed after higher-income elderly protested new premiums. A new Medicare fee schedule for physician and other professional services, a resource-based relative value scale, replaced charge-based payments. Limits were placed on physician balance billing above the new fee schedule. Physicians were prohibited from referring Medicare patients to clinical laboratories in which their physicians, or physicians' family members, have a financial interest. 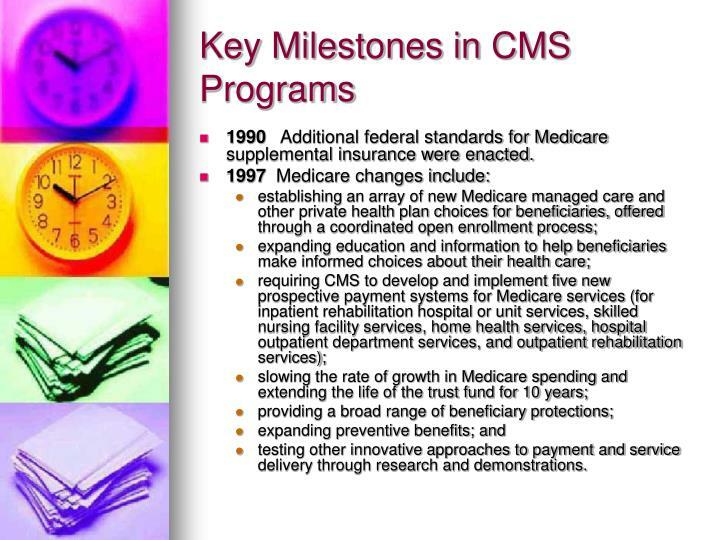 1990 Additional federal standards for Medicare supplemental insurance were enacted. testing other innovative approaches to payment and service delivery through research and demonstrations. 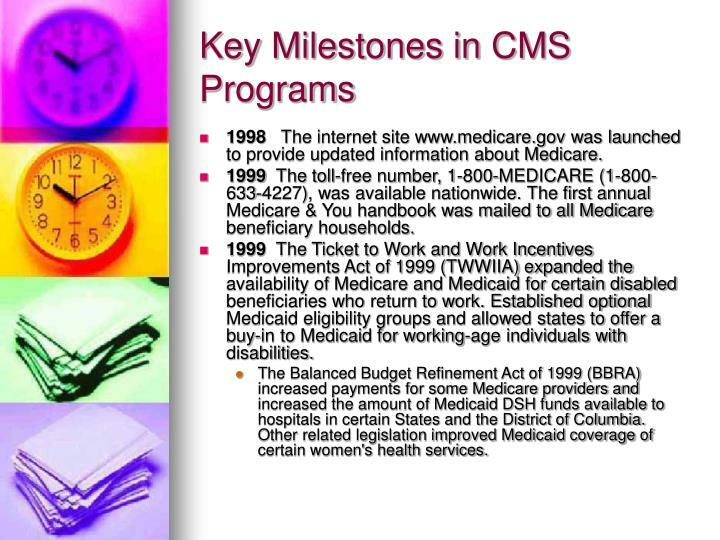 1998 The internet site www.medicare.gov was launched to provide updated information about Medicare. 1999 The toll-free number, 1-800-MEDICARE (1-800-633-4227), was available nationwide. 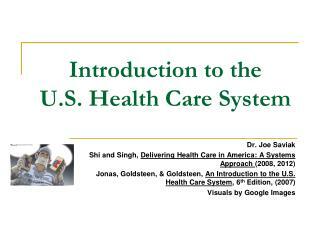 The first annual Medicare & You handbook was mailed to all Medicare beneficiary households. 1999 The Ticket to Work and Work Incentives Improvements Act of 1999 (TWWIIA) expanded the availability of Medicare and Medicaid for certain disabled beneficiaries who return to work. Established optional Medicaid eligibility groups and allowed states to offer a buy-in to Medicaid for working-age individuals with disabilities. The Balanced Budget Refinement Act of 1999 (BBRA) increased payments for some Medicare providers and increased the amount of Medicaid DSH funds available to hospitals in certain States and the District of Columbia. Other related legislation improved Medicaid coverage of certain women's health services. 2000 The Benefits Improvement and Protection Act (BIPA) further increased Medicare payments to providers and managed health care organizations, reduced certain Medicare beneficiary copayments, and improved Medicare's coverage of preventive services. BIPA created a new Medicaid prospective payment system for Federally Qualified Health Centers and Rural Health Clinics and it modified the amount of Medicaid DSH funds available to hospitals, while it provided a one year extension on the sunset of transitional medical assistance provided to families eligible for welfare. 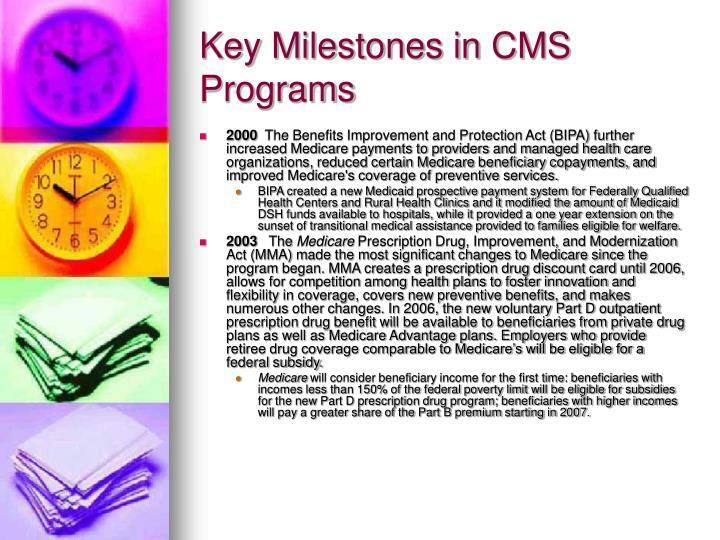 2003 The Medicare Prescription Drug, Improvement, and Modernization Act (MMA) made the most significant changes to Medicare since the program began. MMA creates a prescription drug discount card until 2006, allows for competition among health plans to foster innovation and flexibility in coverage, covers new preventive benefits, and makes numerous other changes. In 2006, the new voluntary Part D outpatient prescription drug benefit will be available to beneficiaries from private drug plans as well as Medicare Advantage plans. 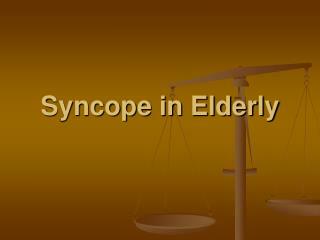 Employers who provide retiree drug coverage comparable to Medicare’s will be eligible for a federal subsidy. Medicare will consider beneficiary income for the first time: beneficiaries with incomes less than 150% of the federal poverty limit will be eligible for subsidies for the new Part D prescription drug program; beneficiaries with higher incomes will pay a greater share of the Part B premium starting in 2007. 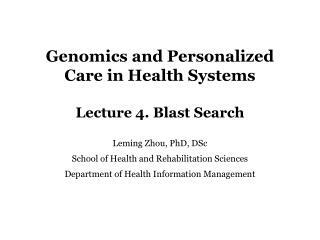 Genomics and Personalized Care in Health Systems Lecture 4. 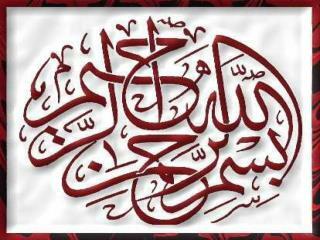 Blast Search -. 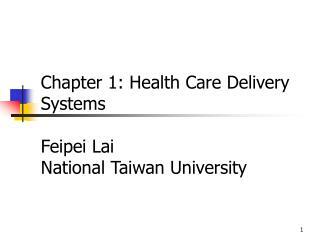 leming zhou, phd, dsc school of health and rehabilitation sciences department of health information management. outline. blast algorithm blast search other programs.